Stonehead Bikes is committed to proffer especially designed Rajasthan motorbike tours. If you are looking for an unprecedented experience through a bike tour to Rajasthan, give us a shout for Rajasthan-Agra packages on bike. We have hosted countless trips to Rajasthan by bikes and boast upon a happy client base that appreciates us for a never before experience. - Visit the Land of the Maharajas in the most luxurious way possible. - Traditional ornately decorated Havelis in Mandawa. - Discover the history of India from Mughal empire to the Rajput era. - Experience the timeless beauty of cities like Mandawa, Bikaner, Pushkar and Jaipur. - Visit iconic symbol of love marble structure Taj Mahal commissioned by Shahjahan, which is one of the seven wonders of world and Tomb of Itmad-Ud-Daulah. - Visit one of the finest symbol of Hindu Rajput Clan Architecture – Amber Fort. A UNESCO World Heritage Site. You can spend hours admiring various interal structures like Diwan-E-Aam, Sheesh Mahal , taking photographs and strolling in the huge Fort. - The Program schedule / route / mode of transport might be changed due to unforeseen circumstances or for the safety of the group; the decision of the Program Director and/or the Road Captain will be final & binding in this regard. - In case any participant falls sick during the tour, the expenses for medical treatment, travel and porter charges etc. will be borne by the concerned individual. - During the tour, the decision of the Program Director and/or the Road Captain will be final and binding by any means and in any regards. - Stoneheadbikes shall not be held responsible for any accident, illness and loss of valuables or such other unforeseen events during the tour. - All purchases are subject to re-confirmation within one business day after purchase, customers will be fully refunded if the orders cannot be confirmed. - Cancellations received 46 days (or more) of departure will incur a penalty of 10% per person. - Cancellations received within 45 days of departure will incur a penalty of 25% per person. - Cancellations received within 20 days of departure will incur a penalty of 50% per person. - Cancellations received within 7 days of departure will incur a penalty of 100% per person. - Unused features are non-refundable. No shows forfeit entire payment. - Trips require a minimum number of participants to avoid cancellation. We reserve the right to cancel a schedule trip to fully refund affected customers although tour companies will make every efforts to maintain the normal operation. - There is 6% handling fee add-on to the above penalties. 02 Mineral Water bottles per person per day during the journey. A reimbursable security deposit of 10000 INR/motorbike. StoneheadBikes representative will be there at the IGI airport (Indira Gandhi International Airport) for a warm welcome and most flights arrive around midnight. Transfer to our hotel in New Delhi by a private bus or taxi for overnight stay. Orientation and other necessary documentation will come about at your hotel itself! After breakfast you will be taken for half city tour of visiting Raj Ghat and Qutub Minar and drive pass through India gate on a legendary Royal Enfield 350 CC bike. Overnight stay at the hotel. After breakfast you will drive to Mandawa. On arrival you will check-in at the hotel. Later we will explore the Rajasthan on two wheels and after that small ride to visit Haveli and villages. Overnight stay at the hotel. After breakfast start to Bikaner, if you want you can visit Junagarh Fort. After visit start ride and on arrival check-in at camp for overnight stay. After breakfast start to Khimsar, on arrival check-in at hotel. Khimsar Fort is located near Khinvsar village. Overnight stay at the hotel & enjoy New Year Eve dinner. After breakfast start ride to holy place Pushkar, evening you will visit Barhma Temple and Pushkar Lake. Evening free at leisure for personal activities. Overnight stay at the hotel. After buffet breakfast, riding towards Jaipur – Pink city of Rajasthan. On arrival check-in into the hotel. Evening free for personal activities. Overnight stay at the hotel. After breakfast start your ride to Agra – City of Taj Mahal. On arrival check-in at the hotel. Later you will be taken for visit to Taj Mahal (Taj Mahal is closed on Every Friday) & Red Fort. After visit come back to hotel for overnight stay. After breakfast, start ride to hotel located in Delhi via Yamuna Express way. On arrival check-in at the hotel. Overnight stay at the hotel. Today to say goodbye to your cruise and in time transfer to Delhi International airport to board the flight for onward destination. Please fill in the online form below with your preferred tour details. Congratulations: your query has been submitted successfully. You'll be soon contacted by our representative after we have processed your details. This normally takes 24 hour's. Newsletter Sign-Up Don't miss an update! Subscribe to our monthly newsletter to receive the latest offers, discount coupons and useful articles. Offering Bike rental in Delhi since 2009. Use Bike on hire in Delhi for sightseeing. Bikes on rent in Delhi available for wedding. Bike Hire in Delhi for events or functions. 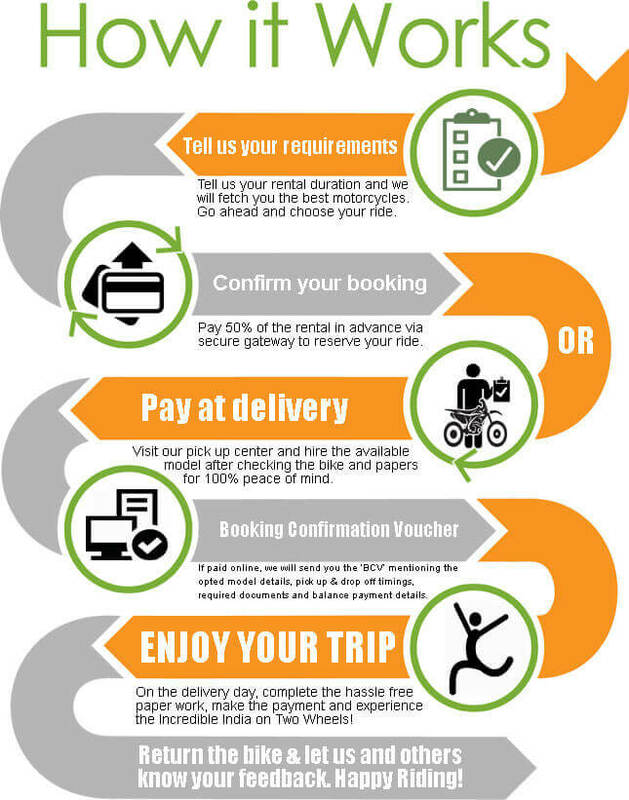 Rent a bike on monthly basis. Renting Motorcycles in Delhi to explore city. Motorbike hire in Delhi for office commute. Motorbike on hire in Delhi for tours and expeditions. Rent Bike In Delhi for promotions. Two Wheeler Rental in Delhi for anniversary celebrations. Motorbikes On Rent In Delhi for road trips, weekend leisure and many more. Bikes rental in India for grand entrance of groom or bride. Most reputed amongst other Bikes Rental Companies in India. Motorbike hire india comes with insurance and other spares to support long tours. Rent a bike in delhi for outstation travel. Scooty on rent in Delhi for local use. Rent Royal Enfield bullet, Classic 350 CC, Thunderbird 350 CC, Himalayan, Desert Strom, Standard 500 CC, Thunderbird 500 CC, Machismo 500 CC, Classic 500 CC, Bajaj Pulsar 220 CC, Bajaj Avenger 220 CC, Bajaj Dominar and many more. Rent KTM Duke 200 CC, KTM Duke 390 CC, Mahindra Thar, Activa, RC 390 CC and many more. We offer you the opportunity to experience the "Indian Dream" by touring the India on a self drive motorcycle, bicycle or car. We are specialized in Bike on rent in Delhi, Pune, Mumbai, Bengaluru, Nepal, Bhutan and Rishikesh and resourced with a team of expert professionals, who are experienced in individual and corporate bike leasing as well. The Bike rental services, offered by us would avail you the best vehicle hiring options in India. We had complied with the needs of various private as well as public sector companies as well. We have got Pan India operations. As a result this, the riders can pick and drop the bike anywhere in India, with us. We have come up with easy as well as safe and secured online payment options for the clients. If you are looking for assistance in planning a trip in North India, then our experts would be completely delighted to cater to your needs. StoneheadBikes also offer a wide variety of options for the adventure rider: hotel booking, easy rider tours, escorted tours with fixed departures and tailor-made motorcycle itineraries to Leh, Manali, Rajasthan, Nepal, Bhutan, Garhwal & Kumaon. © 2017 Stonehead Bikes Pvt. Ltd. All Right Reserved. Success: Password send to registered email successfully!